This St. Maarten's Premier Beach Resort offers 272 spacious and fully equipped suites and 83 two-bedroom villas accommodating up to six people in Simpson Bay. When you choose a beach resort in St. Maarten, you get an island destination that offers two vacation experiences in one: the chance to explore Dutch St. Maarten and French Saint Martin where you can enjoy the beaches and water sports, soak up the ambience, hit the island's hottest duty free shopping spots and when the sun goes down, indulge yourself with some of the finest dining and nightlife in the Caribbean. Simpson Bay Resort & Marina is your home away from home in St. Maarten, a Caribbean island ideally positioned on the beach, midway between the island's most popular night spots and shopping. Fine Restaurants abound to tempt your pallet and an Activity Center makes it convenient for excursions to dive/snorkel spots along with a variety of water sports. The Villas at Simpson Bay Resort are located on the shores of Simpson Bay, next to The Resort, with spectacular Caribbean views. At The Villas you are surrounded by five-star comforts and you have a front row seat at sunset for unfettered views of the Caribbean! In a privileged waterfront setting, The Villas at Simpson Bay Resort have an unparalleled location on the shore of Simpson Bay, a stone's throw from beaches, water sports, restaurants, bars, casinos and shopping. St. Maarten's capital, Philipsburg, is a 10-minute drive and Marigot, its St. Martin counterpart, is only 20 minutes away. Food enthusiasts flock to the "gourmet capital of the Caribbean" for outstanding meals and vibrant nightlife on the island of St. Martin. 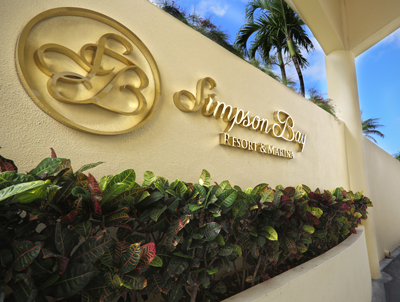 The Villas at Simpson Bay Resort enable you to enjoy all the comforts of upscale oceanfront living. Your elegant, fully furnished caribbean villa has every amenity and feature you could possibly need during your visit, plus a private terrace offering spectacular views of the sea. 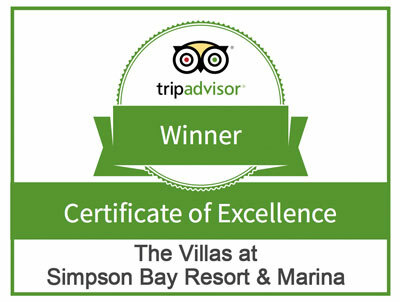 The Villas at Simpson Bay Resort we are proud to announce that we have received a TripAdvisor® Certificate of Excellence award. The accolade, which honors hospitality excellence in St. Maarten, is given only to establishments that consistently achieve outstanding traveller reviews on TripAdvisor, and is extended to qualifying businesses worldwide. Establishments awarded the Certificate of Excellence are located all over the world and represent the upper echelon of businesses listed on the website. So glad we selected this hotel. My wife and I took our 2 young children (3 & 6), and they had a blast. We opted for the 2 bedroom suite, which was huge. 2 full bedrooms, kitchen and living room with 2 murphy beds...we could have had 4 more people in the room comfortably! As we stepped out of the taxi we were greeted with smiles till we left. Everyone is pleasant and helpful. The resort itself is very well kept and while our plan was to rent a vehicle we opted to relax in the resort..
Just returned from a week at the Villas at Simpson Bay Resort (Saturday to Saturday). We lucked out and no hurricanes this September – it was gorgeous. This was our fourth visit to St. Maarten and the Villas. As always, it was wonderful. We are lucky to have friends we travel with, who own a timeshare (back home in Pennsylvania) and trade for the Villas every year. We have been to this resort for the past 3 years. It's a great location, minutes from airport and many great restaurants. We return because we love it and most of the staff. Laura at the pool bar is awesome! Multiple pools all different to suit your liking. Great room for a family with kids. We had a one bedroom suite on the first floor and it was super spacious. A bog kitchen with everything in it, even a dishwasher, big bedroom with perfect sleep quality bed, big bathroom and in the living room 2 separate beds, hidden in the closet. Just perfect.